Spent two nights in Marrakech, ran into most of the people I’d met before, had a pleasant time, but I’m going back so won’t write about it until I’ve got a fuller picture. Arrived in Essaouira. Full of hippies. Lots of British hippies. Urgh. This is what happens when I choose cheap hostels. Ran into the Austrians again tho, which was nice. As was the coach ride here – on a road flat enough to read without vomiting. I’m experiencing a high level of nausea generally and persistent diarrhoea, so things aren’t great, physically. Shaking hands. The family curse kicking in early? I hope not. I hope it’s withdrawal symptoms. For what, I don’t know. There are several contenders. 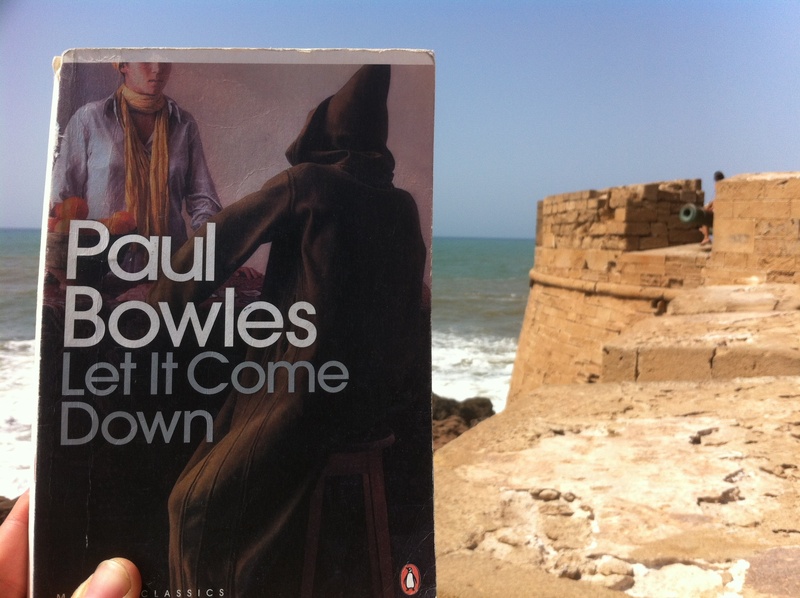 Over the past few days I have read Paul Bowles’ Let It Come Down, a rather middle of the road Tangier-set thriller written in the early fifties. It’s very much of its time, particularly the first part, with the novel only really acquiring any kind of literary lucidity when the protagonist descends into marijuana-fuelled madness. Which is quite good – initially the achingly boring (in my opinion) “marijuana mindset” is quite accurately evoked, the slow distancing and stretching of thought and connection, until over indulgence results in some kind of psychosis. But the book isn’t a morality tale – Bowles was famously a hash and rent boy loving liberal (‘tobacco and boys’), so although the American abroad searching for fun and experience in the text gets his unpleasant just desserts, or whatever, real life was far from that.